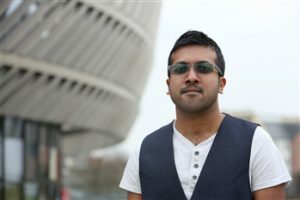 Hara Two earned an MBA from Nottingham University Business School. This gave him the knowledge to create LiveTheGo, an app that personalises and schedules a person’s transport needs. Before this, Hara was in India, where he earned a Bachelor’s Degree while creating his first company. He credits his MBA for teaching him tested business processes and strategies that have given him the confidence and strength to become a better business leader. I’m CEO and founder of LiveTheGo, a ground-breaking new company that is set to revolutionise bus transportation in major cities throughout Britain.I developed innovative real-time mobile technology that significantly improves daily passenger travel for thousands of workers.The idea is deceptively simple, the passenger uses a mobile app to personalise and schedule their individual transport needs. Behind the app is sophisticated programming, that pulls in real-time data from all the cities transport providers to work out the most efficient scheduling. In layman’s terms, it’s Uber for public buses. Future developments include connected cab-bus transport, use of smart devices such as smartwatches, and even interactive voice response.The vision is to enable transport companies run a city’s public transport entirely based on people’s demand, a democratic transport system if you will. Trials are all set to start in a few months, and we have a few auto manufacturers who are discussing partnerships with us.I’m also CEO of the Hara Business Group in India, which business includes tour coach rentals, travel management, event management, and IT services. I started my entrepreneurial career at the age of 18 with tour coach rentals in India, and now my company is the biggest coach fleet in Kerala State, India, counting several multinational companies our client list, such as Tata and Technopark, Trivandrum. Where and when did you earn your MBA? What is the most interesting thing you learnt from your MBA? The most interesting thing I learnt is that, to become a perfect business leader, we should never stop researching and learning from our employees or peers. Teamwork is everything in business, and a good team is a necessity. I found Game Theory really interesting – I never knew how crucial decision making and negotiations are in business, and how they would come to play a vital role in my business. How has the MBA made a difference in your life? In particular, your career path and leadership journey? I started my first business in 2004 when I was studying for my Bachelor’s degree in India. Before the MBA, I had a mix of business successes and failures, but I didn’t know the real reason for this. In short, I was doing things without knowing if it was the way they should be done. The MBA introduced me to tried and tested business processes and strategies that gave me the confidence and strength to become a strong and better business leader. I’m now able to make better decisions from the lessons learned throughout my MBA, inside and outside of the classroom. After completing my MBA 2012, I was able to expand my business in India by increasing revenue, and working with multinational clients including Tata Consultancy Services and Tata Motors. In 2014, I launched LiveTheGo, developing an innovative solution for public transport. This derived from my decade long experience in transportation, with further knowledge coming from what I learnt in my MBA. The great part of my MBA was that in a single year, I covered the core business knowledge that helped me become a better business leader. The case studies from my MBA professors were great to help me learn about managing business in real world. The professors also supported teamwork and mentored us. I am so happy I studied an MBA from Nottingham. It has made me a sell myself as an entrepreneur. Now, I am mentoring a few start-ups in my field by spreading my lessons from my MBA.